Approaching Jesus, by Cathy Madavan, is a Cover to Cover Lent Bible Study for your small group that gives you an honest and thoughtful look at Jesus through the eyes of the people who approached him in the accounts given in the Gospel of Matthew. During the forty days in the wilderness, Jesus was tempted and tested but above all He demonstrated a powerful understanding of who He was, and what mattered most to Him. This series is designed to help you learn more about who Jesus is today, and apply it to your own life. These practical and personal six studies combine honesty with humour in order to take you through the 40 days of Lent. They aim to help you approach Jesus again as you look through the eyes of people who approached Jesus in Matthew's Gospel. There is room to make notes in the study guide, which is very useful for individual reflection. The back of the book also contains Leader's notes which will help small groups get the maximum benefit from using these exciting new studies. 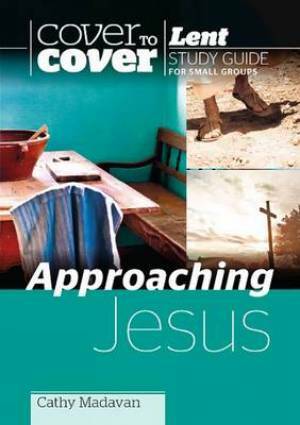 Approaching Jesus by Cathy Madavan was published by CWR in September 2014 and is our 3258th best seller. The ISBN for Approaching Jesus is 9781782592433. Be the first to review Approaching Jesus! Got a question? No problem! Just click here to ask us about Approaching Jesus.